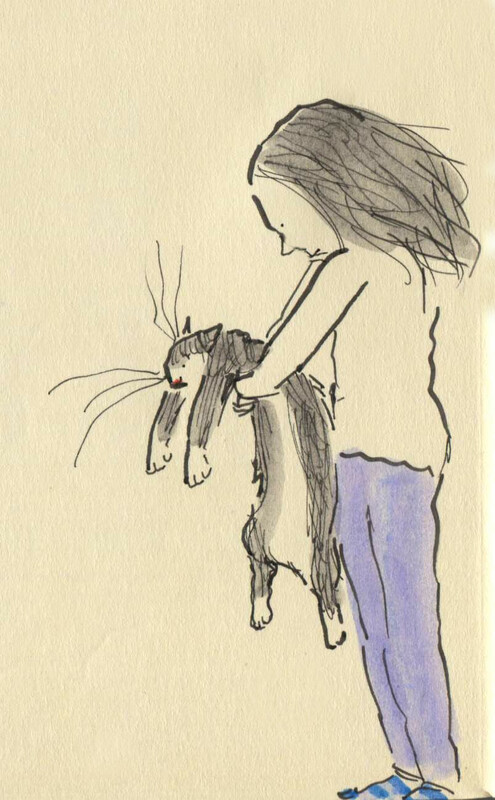 Posted on April 27, 2015, in Uncategorized and tagged cats, Doodlemum, Drawing, fluffy, Humour, Pen and Ink, Sketchbook. Bookmark the permalink. 9 Comments. I had a cat named Fluffy. He was hit by a car and we had to put him down. My whole family cried. Oh you poor things, R.I P Fluff, x. When we lived in our previous home, with a corner garden, we often discovered dead cats just below the wall- they’d obviously been hit by cars and their drivers had tossed them into our garden. My 9 year old daughter found the first and was extremely distressed. Wow, that’s heartless that people would toss the dead cats in your garden. We were lucky in that the person that hit Fluffy, did so right in front of our house and stayed to talk to us and apologize. We lived on a very busy road. We have a dog now and she’s always on a leash (unless at an enclosed dog park) so we don’t have to worry about that. I always wondered why they made slinky dogs when actually slinky cats would have been much more realistic. Has Arnie had a wash?! Evie will stretch him out of shape, if she carries on like that!